Playing captain Gillian Kyle helped guide Renfrewshire to a first success in the Scottish Women’s County Finals since 2010 over glorious Glenbervie. Kyle’s charges edged out Midlothian for the title after an exciting closing day’s play at the Stirlingshire venue, with Perth & Kinross and Dumfriesshire also contesting the three-day Finals competition. Played in a round-robin format including foursomes and singles ties, both matches finished level on Friday, but Renfrewshire’s 5.5 – 3.5 win over Perth & Kinross on Saturday and their 6 -3 victory over Dumfriesshire today ensured they accumulated more overall points than Midlothian (16 – 11 compared to 14.5 -12.5). 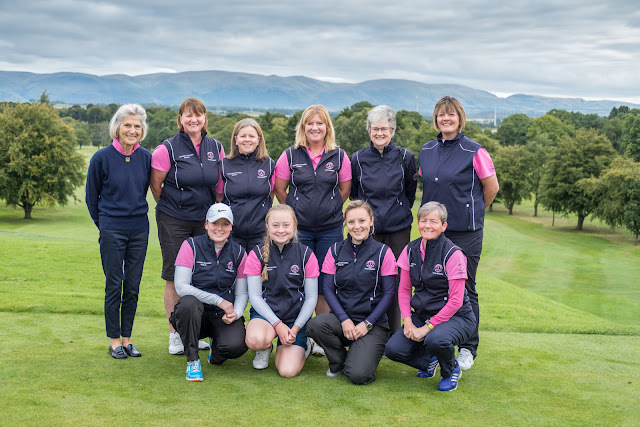 In a well-contested event, first played in 1909, Renfrewshire achieved only their 10th win overall and their first since 2010 at Bothwell Castle. With Scotland internationalist Eilidh Briggs producing four wins from four over the weekend, and backed up by her sister and fellow Kilmacolm member, Megan, Renfrewshire were in fine form. Cochrane Castle’s Donna Jackson, a member of the winning team in 1987 and 2010, also played her part for her own personal hat-trick of triumphs, with Denise Cowan (Ranfurly Castle), Jennifer Rankine (Haggs Castle), Carol Whyte from Milngavie and Greenburn’s Liz Stewart also in the line-up. East Renfrewshire’s Kyle said: “It was very exciting. Every match was very close and we just managed to pip Midlothian. We’ve been quite good at foursomes this week and that was important for us. Runners-up Midlothian featured Broomieknowe’s Hannah Darling, the youngest ever winner of the Scottish Girls earlier this season aged 13, and Scotland internationalist Gabrielle Macdonald (Craigielaw).